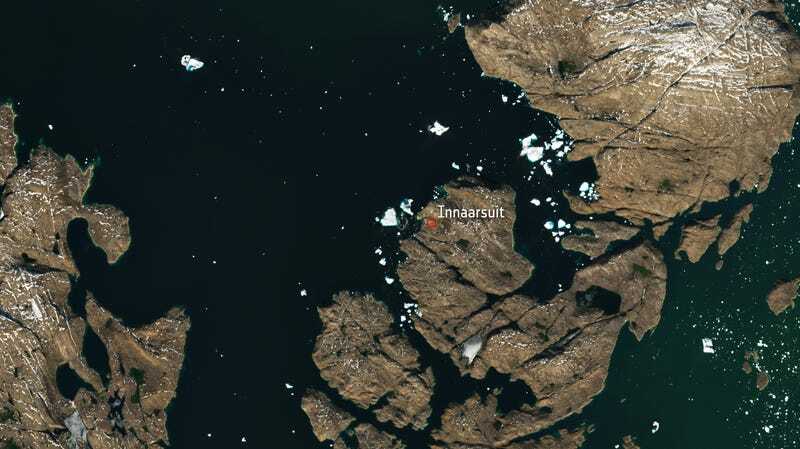 A large iceberg looms over the village of Innaarsuit in this July 9 satellite image. If you needed a visual representation of our global environmental crisis in 2018, it doesn’t get much better (well, worse) than the gigantic iceberg looming over the village of Innaarsuit in Greenland, now seen from the vantage of space. Last week, news outlets began reporting that an alarmingly large iceberg had drifted close to Innaarsuit, a village of about 170 people on Greenland’s west coast. Folks were concerned the iceberg could crack apart and generate a dangerous tsunami wave, a fear stoked by memories of last summer, when a freak tsunami wave flooded the western Greenland village of Nuugaatsiaq, killing four people. Things have been looking up since the weekend, when KNR reports that the iceberg drifted about 500-600 meters further north, causing authorities to lift evacuation orders. But according to KNR, a new danger zone includes the village’s power plant, so Innaarsuit isn’t quite out of the woods yet. On Tuesday, the European Space Agency released a satellite image snapped by Sentinel-2A on July 9 that offers another striking visual of the village’s predicament. The ‘berg, which ESA says weighs approximately 10 million tons, looms large over the village, which wouldn’t even be visible if the space agency didn’t helpfully circle it in red. Icebergs have always posed a risk to folks living in the far north. But in our current era of rapid climate change, events like this are a stark reminder of how changing ice conditions uniquely threaten the people of the Arctic. As global temperatures rise, Arctic sea ice is vanishing. Greenland is also losing a tremendous amount of ice as some of its largest coastal glaciers accelerate toward the sea. Changes to ice are disrupting Arctic shipping and affecting subsistence hunting traditions that have sustained villages for generations. Calving events that produce large, dangerous icebergs also seem to be happening more and more. Last month, Holland captured video footage of an iceberg roughly the size of lower Manhattan breaking off Helheim Glacier on Greenland’s east coast.